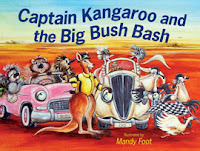 Mandy Foot's amusing and creative illustrations of well-known bush animals complement this new in-house Captain Kangaroo picture book. The annual Vintage Outback Race is taking place with Captain Kangaroo at the starting point to send the teams on their way. The wombats in their pink cadillac with pink tutus to match are the cutest, but the overalled koalas in their FJ Ute, the pelican motor-cyclists, be-scarved emus, and spiky echidnas are most appealing, too. Frilly lizards and other creatures add to the colourful scene. 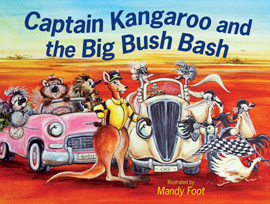 When Captain Kangaroo waves the green flag they are off, and the Big Bush Bash begins. Mandy captures the flying start perfectly, as well as the problems along the way. The rhyming language is out of sync at times but it is barely noticed with all the action going on. Icon names, e.g., the Murray, Lightning Ridge, Longreach, Alice (and the Ghan) will have the kids Googling the map and asking questions. The race is interrupted while Captain Kangaroo is commended for his help in the Royal Flying Doctor Service. It is such a schamozzle at the finish line in Broken Hill who knows who won the race! A ballerina wombat, maybe? My grandson will love this picture book with the hectic pace and fabulous illustrations. It will make a great Christmas gift.